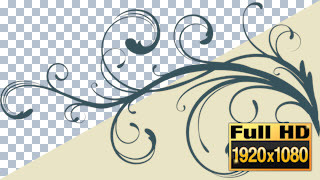 Flourish, vines animation for Full HD videos. The video is transparent (pre-keyed) with alpha channel so you can use it as an overlay on other videos. The color is easily changed in most video editors for example Camtasia. These flourish animations are great for any project or backdrop or import and combine with other elements to create unique title effects, logo revealers or picture frames & backgrounds. You can change the colors easy by using hue & saturation or color effects in your favorite video editor.